A NASA spacecraft will zoom by Earth today (Oct. 9) to use the planet's gravitational pull as a speed boost for its trip to Jupiter and you can see live views of the probe live online during the flyby. NASA's Juno probe will be a mere 347 miles (558 kilometers) from Earth and over South Africa when it makes its closest approach at 3:21 p.m. EDT (1921 GMT). Later tonight, at 9:30 p.m. EDT (0130 GMT), the online Slooh Space Camera will track the Juno spacecraft's Earth flyby live in a free webcast. "Besides watching on Slooh, viewers near Cape Town, South Africa, will have the best opportunity to view the spacecraft traveling across the sky," Slooh officials said. "The spacecraft will most likely not be visible to the unaided eye, but binoculars or a small telescope with a wide field should provide an opportunity to view." NASA launched the Juno in August 2011 on a mission to study Jupiter in unprecedented detail when it arrives at the gas giant planet on July 4, 2016. The $1.1 billion Juno mission to Jupiter will use nine instruments to probe deep inside Jupiter to reveal glimpses into the planet's origin, structure, atmosphere and magnetic field. It is named after Juno, the mythological wife of the god Jupiter who used special powers to learn the secrets Jupiter had hidden beneath cloud cover. But first, the Juno spacecraft has to get to Jupiter. NASA used an unmanned Atlas 5 rocket to launch Juno in 2011, but the rocket was not powerful enough to send the spacecraft all the way to Jupiter. Instead, it sent Juno on a looping trajectory that carried it beyond the orbit of Mars and back so it could around Earth today in what scientists call a "gravity assist." Juno is currently streaking through the solar system at a speed of 78,000 mph (126,000 km/h), with respect to the sun. During the gravity-assist speed boost, Earth's gravity will cause Juno to accelerate by as it approaches the planet. Once Juno completes the flyby, it will be travelling at about 87,000 mph (140,000 km/h). Juno mission principal investigator Scott Bolton, of the Southwest Research Institute in San Antonio, Texas, has likened the maneuver to a "second rocket launch." While 97 percent of NASA is currently on furlough due to the ongoing government shutdown, the agency's Jet Propulsion Laboratory — which manages the Juno mission — remains on duty for now. During Juno's Earth flyby, the spacecraft is expected to test its science instruments and snap photos of Earth and the moon. "One of Juno's activities during the Earth flyby will be to make a movie of the Earth-moon system that will be the first to show Earth spinning on its axis from a distance," Bolton said in a statement. The probe will also flex its scientific muscle in other ways. 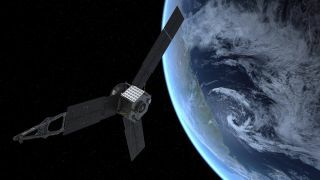 "We'll exercise the science instruments, since Juno’s instruments will be operating in a magnetospheric environment for the first time," said spacecraft engineer Jeff Lewis, Juno operations lead for spacecraft builder Lockheed Martin Space Systems. "The Earth’s magnetic field will allow a number of the instruments to be tested. We're also using the flyby of the moon as an opportunity to gauge how the spacecraft operates. Since Juno is a spinning spacecraft, we need to sense the right time to take data as the moon, or Jupiter, passes through the instruments' fields of view." But the star of today's Earth flyby is the gravity assist maneuver itself, scientists said. "Juno will be really smoking as it passes Earth at a speed of about 25 miles per second relative to the sun. But it will need every bit of this speed to get to Jupiter for its July 4, 2016 capture into polar orbit about Jupiter," said research scientist Bill Kurth of the University of Iowa, who is the lead investigator for two of Juno's instruments. "The first half of its journey has been simply to set up this gravity assist with Earth." Today's Slooh webcast of the Juno flyby of Earth can be tracked directly from the Slooh Space Camera website (http://www.slooh.com) and via the Slooh iPad app.